You will need to download the free Acrobat Reader software and install it on your computer to read some of these files. It is available at . Many documents are in JPG form and you do not need Acrobat. A note from the Webmaster: Morning Reports are not included in this section. 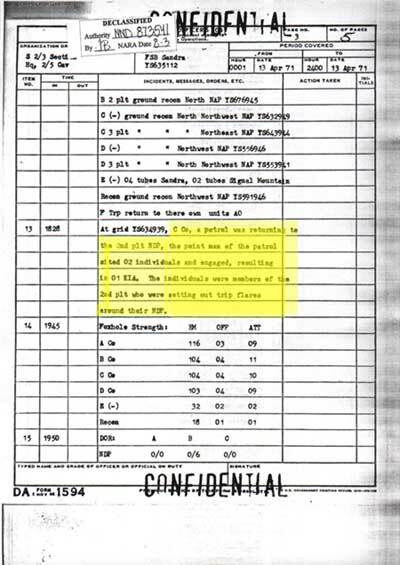 The copies from the National Personnel Records Center are made from microfiche and are of extremely poor quality. It is barely possible to read those copies, and the quality would suffer so much by putting them on the web that they would be unusable. I am slowly building a collection of Morning Reports, but probably have less than 5% of all the Morning Reports created during the company's time in Vietnam. I will be happy to answer any questions from legitimate veterans of C 2/5 Cavalry. Email me at webmaster@tallcomanche.org. General Order 1452, dtd 5 May 1966. Awarded the Air medal to members of the 2/5 Cavalry. Courtesy Parnell Bethune. Caution: very large file. General Order 3259, dtd 17 September 1966. Awarded the Air Medal to multiple members of C 2/5 Cavalry. Courtesy Thomas Talton. Caution: very large file. General Order 1310, dtd 27 March 1967. Awarded Purple Heart to Larry Evans, Thomas Clark of C 2/5 Cav. Courtesy Larry Evans. General Order ??? ?, dtd 25 September 1969. Awarded the Bronze Star Medal for Meritorious Service to multiple members of C 2/5 Cav (Courtesy Jerry "Doc" Watson) Caution: large file. General Order 1953 dtd 7 February 1970. 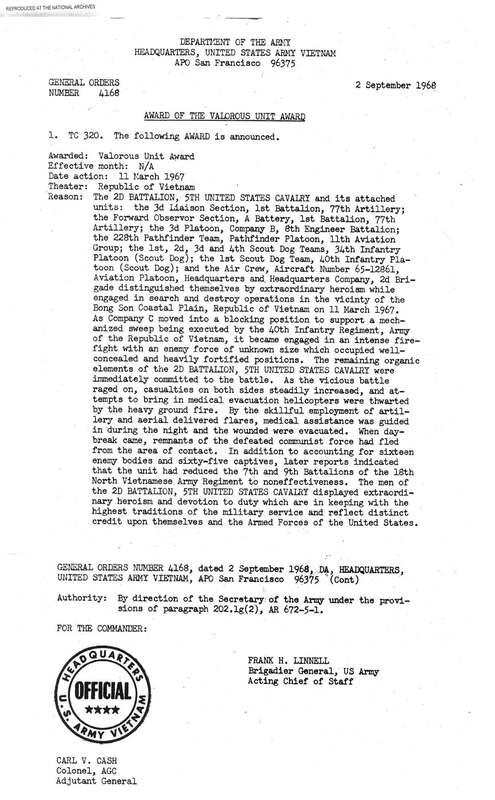 This order awarded the Silver Star to Mike Hayes for actions on October 6, 1969. 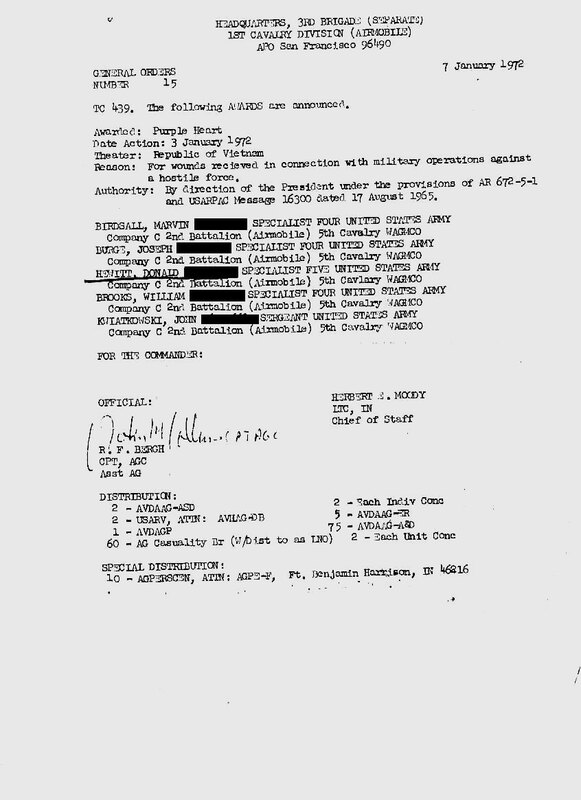 General Orders 14113 dtd 5 August 1970. This order awarded the Army Commendation Medal with "V" Device to Mike Combs. Courtesy Mike Combs. General Order 18914 dtd 3 November 1970. 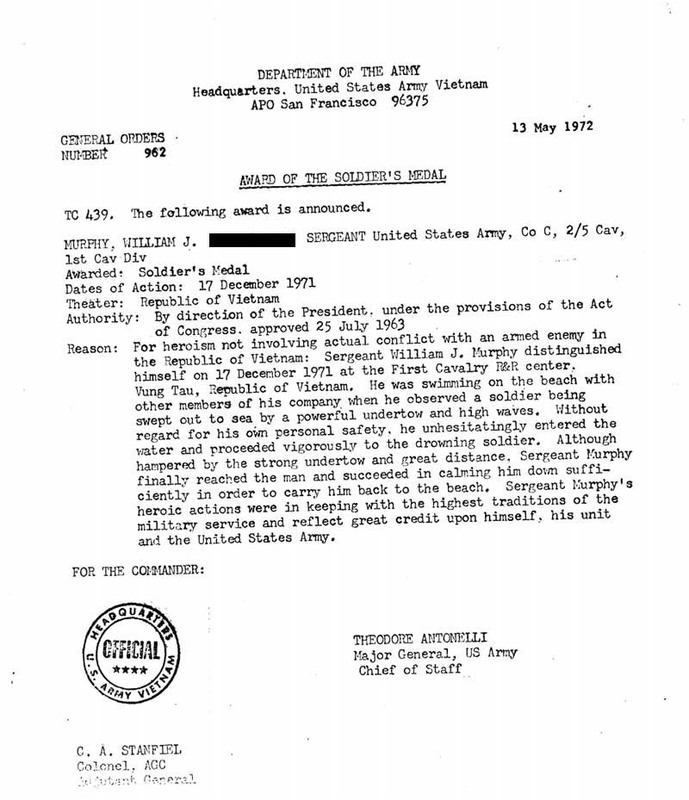 This order awarded the Bronze Star Medal with V Device to Mike Combs for actions on 16 October 1970. General Order 22152 dtd 26 December, 1970. 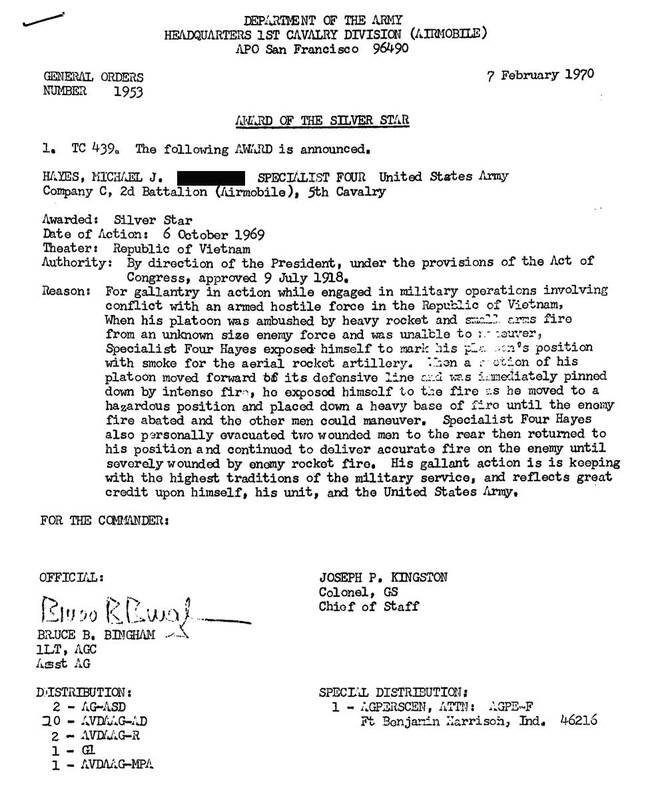 This order awarded Nick Gallo the Army Commendation Medal with "V" device for actions in Cambodia. Courtesy Nick Gallo. 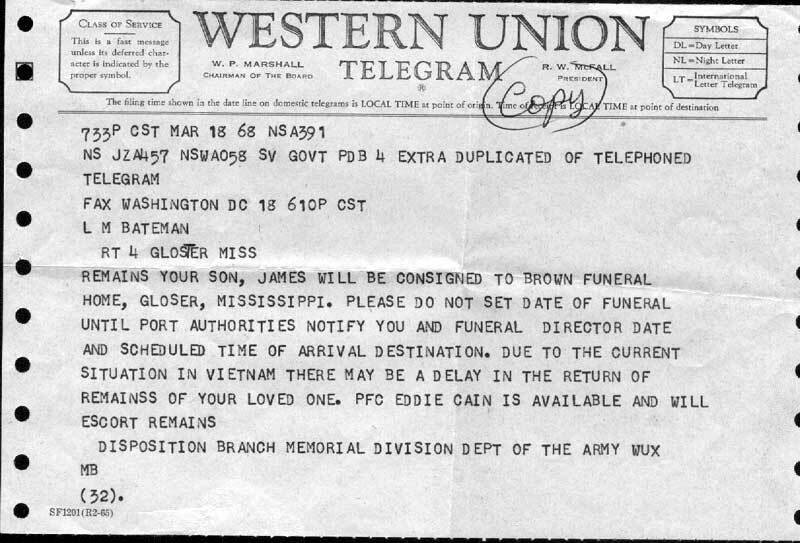 General Order 566 dtd 12 January 1971. 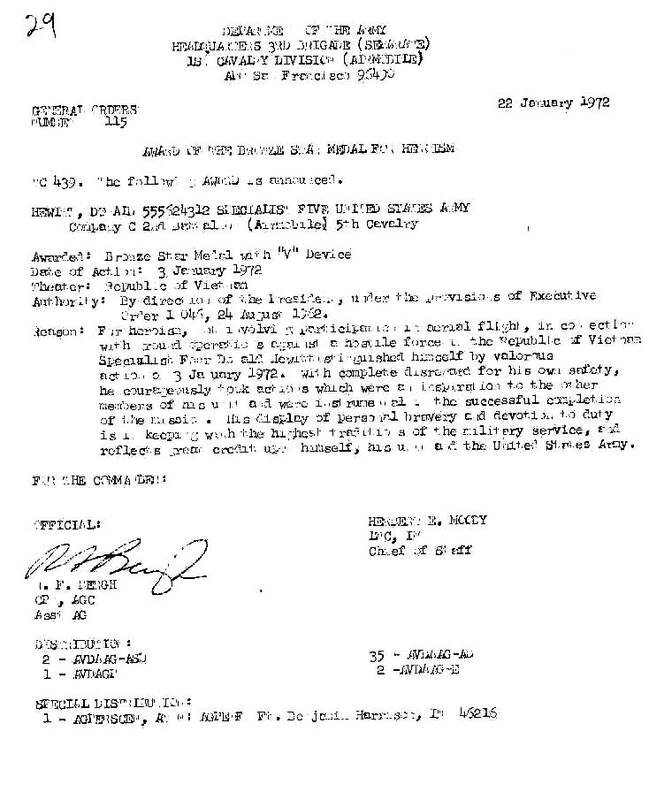 This order awarded the Bronze Star Medal for Meritorious Service to a number of men in C 2/5 Cav. Courtesy Mike Combs. General Order 3580 dtd 24 February 1971. This order awarded the second award of the Army Commendation Award to Mike Combs. Courtesy Mike Combs. 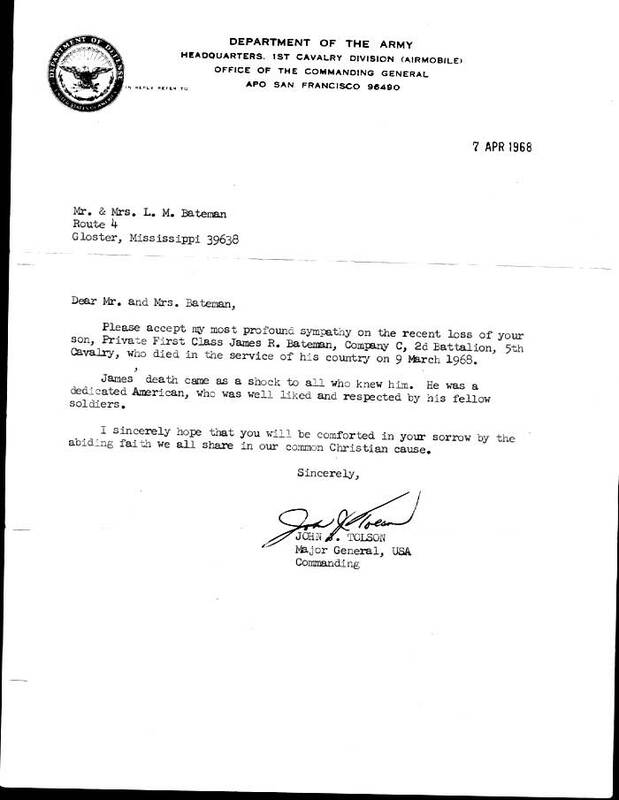 Letter Order 331 dtd 30 July 30, 1965. 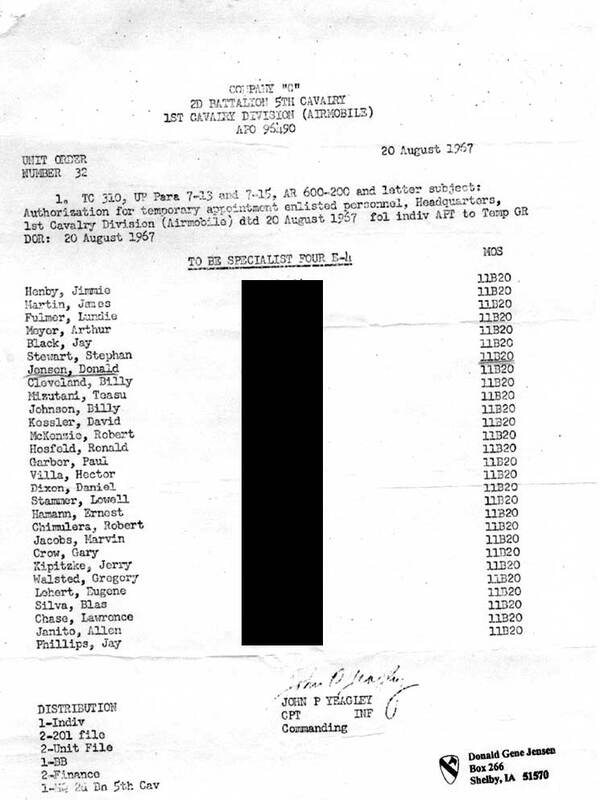 This order, along with the accompanying roster, sent the company to Vietnam. Operations of Company B, 2nd Battalion, 5th Cavalry, 1st Cavalry Division (Airmobile), in the Attack Upon a Main Force Viet Cong Heavy Weapons Battalion, in the Vicinity of Bong Son, Republic of Vietnam, 16-17 February, 1966. This was published as a monograph of CPT Robert W. McMahon while he was attending the Advanced Infantry Officer's Course at Ft. Benning in 1966. 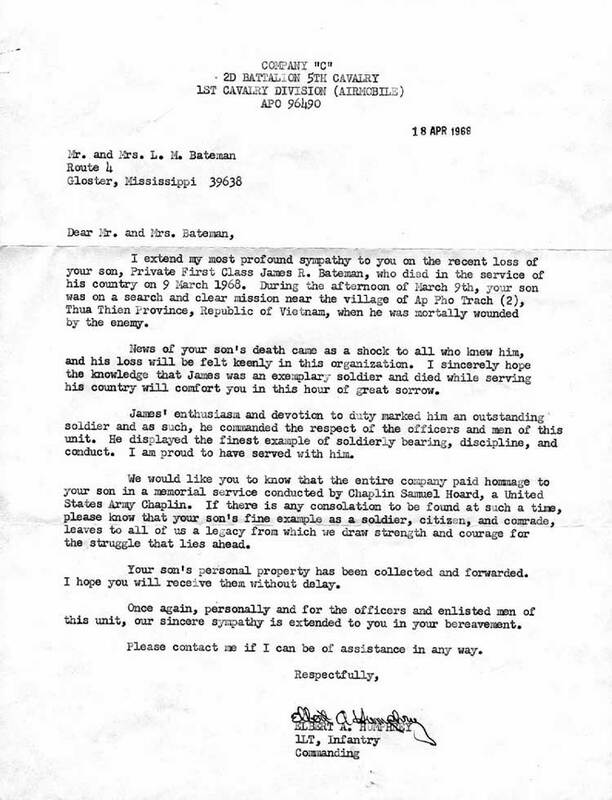 Letter of Condolence written by 1LT Elbert Humphrey to the Next of Kin of PFC James Bateman, KIA March 9, 1968. 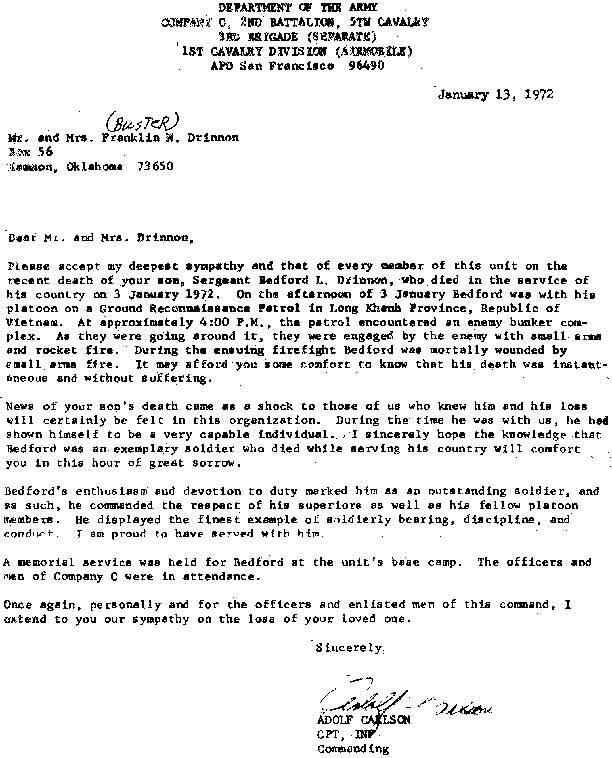 Letter of Condolence written by CPT Dolf Carlson to the Next of Kin of SGT Bedford Drinnon, KIA Jan 3, 1972.